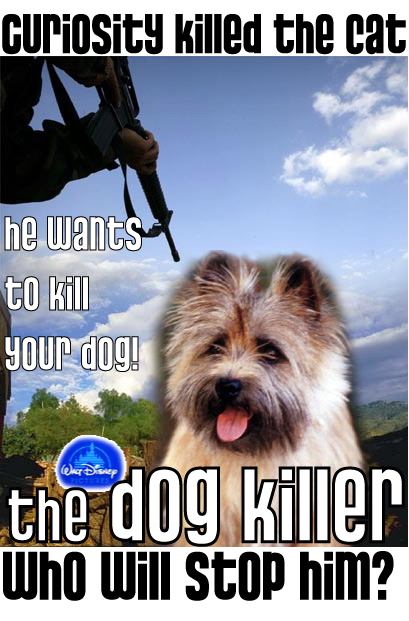 New York, NY Following Tuesday�s announcement of the release of Disney�s latest family oriented animal theme movie �The Dog Killer� corporate offices for Disney has been inundated with calls. Company officials are reeling to deal with the backlash from animal rights groups like People for the Ethical Treatment of Pet Entertainers, Vocalists, and Engineers (PETPEVE). While many critics argue that the film�s premise is a stretch, other critics say that is no more far fetched than a movie whose premise has a chimpanzee whose opinion about movies is so in-line with the public�s taste that he can predict hit shows. Ironically the critic offering this opinion was Raffles the Chimpanzee. �I was trying to use this film as a metaphor for terrorism. The Dog Killer represents the terrorist threat. Scribbles the dog represents the American public. The film speaks to the idea that through persistence and a keen sense of smell, we may just be able to eliminate these terrorist groups. I am sorry that these animal rights fanatics cannot see it on the figurative level,� said the writer/director Squeaky Moore. Some believe Moore got the chance to make this movie based on the assumption that he was related to Michael Moore, which he is not.